You know what time it is? That’s right, it’s bacon time. 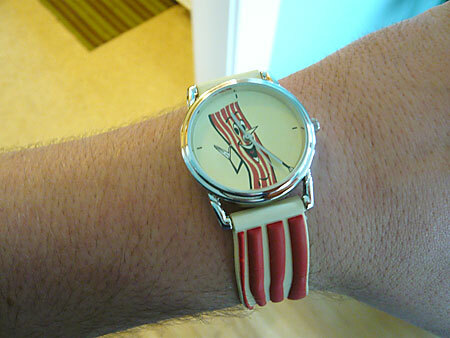 I can tell, because I’m wearing a bacon watch. I showered this morning with bacon soap. I just mixed some pork belly with salt and brown sugar, in pursuit of some more homemade bacon. And yet, bacon in most of our lives remains commodity. My neighborhood grocer carries just a few kinds, all variants on corporate bacon, anonymous, industrially-raised pigs, processed and packaged with low price as the primary goal. Meanwhile, the store carries more than 20 different types of honey, but you don’t see blogs being written about bee secretion. Wendy’s, maker of the infamous “Baconator,” uses pre-cooked, microwave-warmed bacon for its signature sandwich. Bacos™ are vegan. Let me repeat that for you. Bacos™ are VEGAN. Something is wrong, and my goal this week is two-fold: celebrate our favorite food, but also to expose the brighter side of pork, the small batch producer who cares as much (or more) for his animals and flavor as he does his bottom line. I’d like to call your attention to altruistic bacon. It exists, it’s tasty, and it’s worth seeking out. I hope you’ll stay tuned.